What is the difference between Dutch cocoa and natural cocoa? At first glance, Dutch-processed cocoa is darker in color than natural cocoa powder. 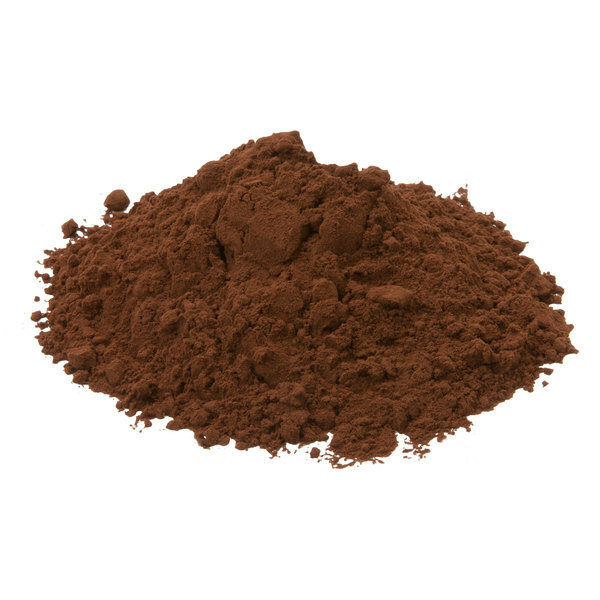 Though both types of cocoa powder are acidic, Dutch cocoa powder has been washed in a potassium solution to neutralize its acidity, which produces its dark, rich color. 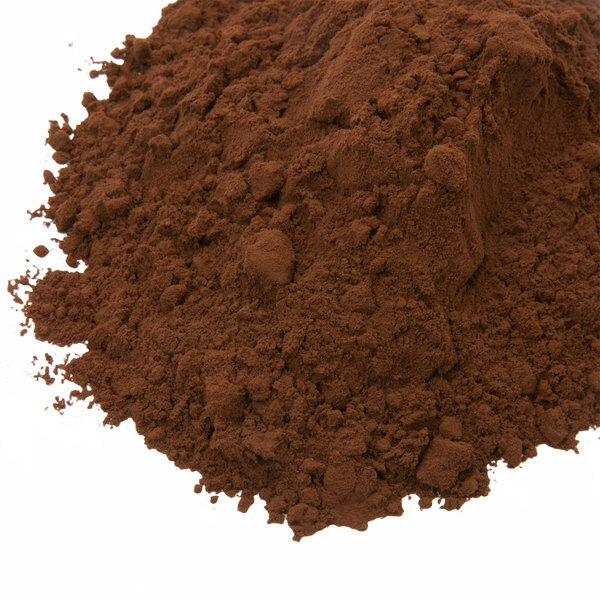 Natural cocoa powder tends to have a lighter color because of the acids left intact. Most cocoa powder you will find in American grocery stores is natural cocoa powder. In terms of baking, Dutch cocoa powder is often paired with baking powder, whereas natural cocoa powder is usually paired with baking soda. This 2 lb. 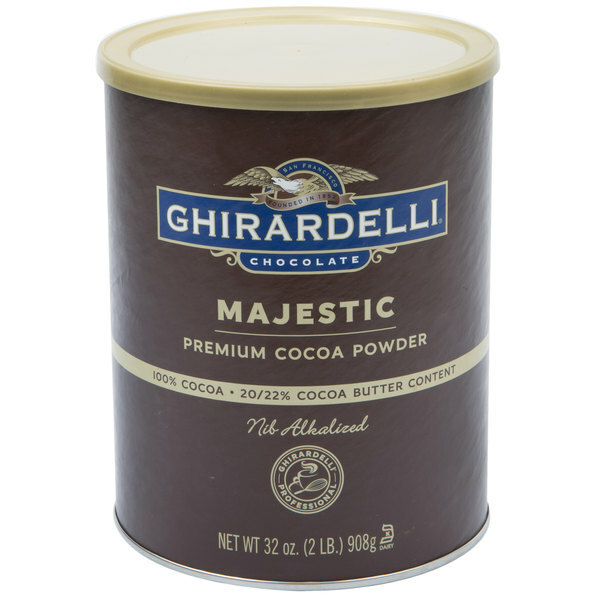 majestic dutch cocoa powder is Ghirardelli's most decadent cocoa powder available. With its remarkably bold flavor and extra dark brown color, this cocoa powder will enhance the look, aroma, and taste of your baked goods, beverages, and confections. Use it for cakes, muffins, mousse, ganache, and truffles. It even enhances signature mochas, hot chocolate bases, gelato, and chocolate ice cream bases with its exquisite, bold chocolate flavor. Ghirardelli uses the heart of the cacao bean, called the nib, to create this premium dutch-processed, nib-alkalized cocoa. The nibs are ground, pressed, and pulverized to release their intense flavors. They are then treated with an alkali to neutralize acids. This process gives it a darker color and a mild, subtle flavor that complements other baking ingredients. Customers will recognize and trust the Ghirardelli name when they see it in your cafe, coffee shop, ice cream parlor, or restaurant. Ghirardelli began with a young Italian chocolatier in the early 1800s and is now a brand widely known for its rich flavors. This sense of quality is the result of Ghirardelli's commitment to control all steps of the chocolate-making process, from roasting the cocoa beans, to refining the product for smoothness and well-balanced flavor. In addition, the company understands that sustainable sourcing and knowing the origins of the cocoa beans speaks to the quality of the finished product. No matter what dish or drink you prepare, guests are in for a treat with this majestic dutch cocoa powder! This item is certified dairy Kosher by KOF-K Dairy Kosher Supervision. 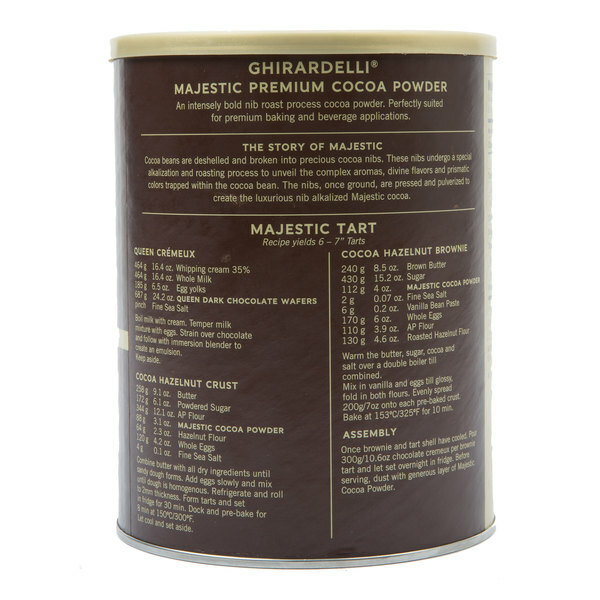 The aroma of this ghiradelli majestic dutch chocolate cocoa powder is amazing! The smell is exactly of a rich cocoa powder which makes it excellent for dusting. 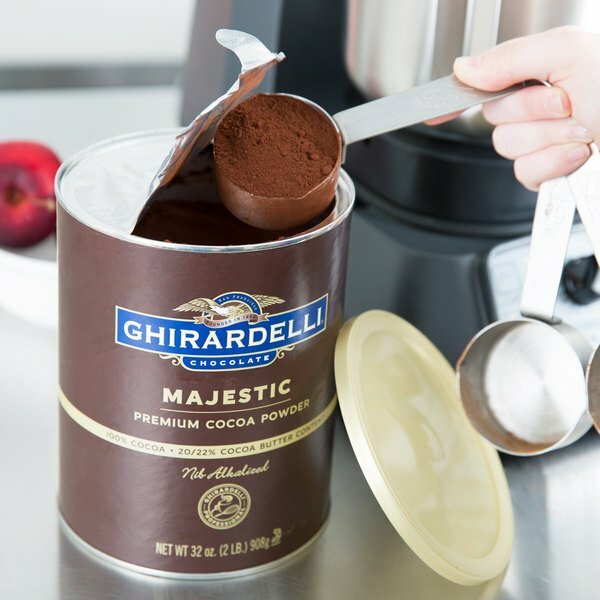 Ghiradelli cocoa powder is high in quality and tastes very rich. It has a slight bitter taste to it. We use this product to dust on top of cream. This powder is perfect. When you combine this powder and the natural coca powder it give a delicious chocolate buttercream. I will buy the bigger pack net time. We use this cocoa powder to top off all of our mochas in our coffee house. We used to use just a normal cocoa powder, but this one is so dark and rich that it really added elegance to our drink presentation. This is a really great value for cocoa powder so I will definitely continue to purchase. I use this cocoa powder in brownies, cakes, cupcakes, frostings and cookies and is quite versatile for all. However, I was surprised to find it doesn't have as much chocolate flavor as I would like. 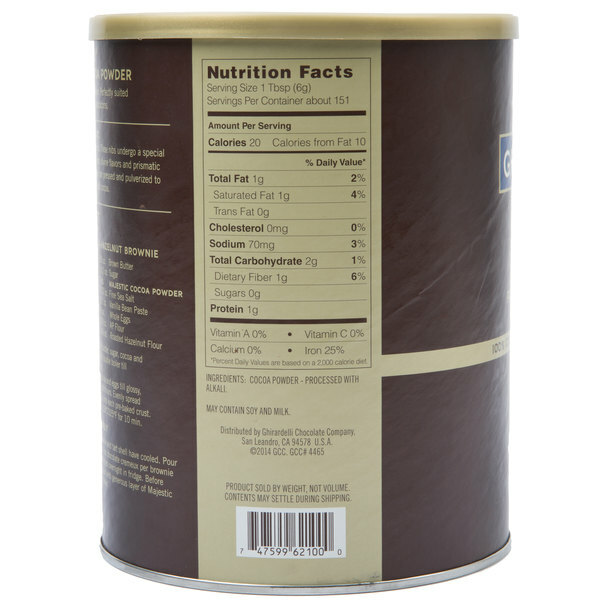 When using this cocoa powder in my bakery recipes I either have to increase the amount of cocoa powder used or pair this with natural cocoa powder in order to get the depth of chocolate flavor I am looking for. This Ghirardelli Dutch cocoa powder is probably one of the best I have tried. Its great for making homemade Lava cakes and works very well to make a chocolate cheesecake. This cocoa powder is great, Very dark. I mix this with my normal coco powder to have the perfectly balanced chocolate cake and cupcakes. And its a pretty big container!If you want a professional taste for your chocolate bakes goods, definitely get this. Where do I begin? This brand is one of the best there is! This rich powder adds such an awesome flavor to all your goods. Don't let me forget to mention also that love the price too. Webstaurant is by far one of the greatest distribution companies. Their prices, prompt delivery, wide selection of products, and friendly customer service is unmatched in my book. This cocoa powder becomes my favorite so far. I love it on my cookies, buttercream, and cake recipes. Not so good on French Macarons though. The color is so rich that I would say as dark cocoa powder. This cocoa powder is very dark. The taste is super rich. I used this to make chocolate flourless cake and I can't believe how dark the cake came out. 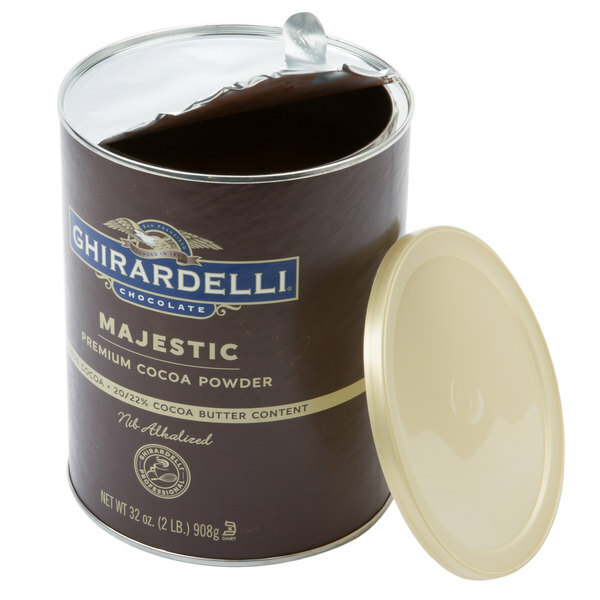 The Ghirardelli Majestic Cocoa Powder is a wonderfully rich and reddish/dark cocoa powder with a pronounced quintessential roast chocolate flavor. With a fat content of 20/22% it falls into the premium cocoa category and is in good price point to compete with more expensive and famous brands like Cacao Berry, Valrhona, etc. The price on webstaurantstore is excellent. Definitely going to be getting more in the future. this is a really dark and rich cocoa powder. it's really great if you want super chocolatey brownies or cakes. i use it every time i want a really pronounced chocolate flavor and it never disappoints. This Majestic Cocoa Powder makes the darkest and most decadent chocolate cake and chocolate buttercream. It is a great price at webstaurant, and a must try...I will continue to purchase it in the future. We love this extra dark cocoa powder for all of our dutch cocoa powder applications. We have since switched to buying the larger 25 pound container for a better value. Great quality cocoa, my brownies were super rich and chocolatey. The Dutch cocoa is not extremely bitter, but it is darker than natural - which I love. i typically order Droste dutch processed cocoa but saw this and said why not. This is a great product that I will now use for my brownies and cakes. The richness and dark color is absolutely amazing. Will order 2 cans on my next order in 2 weeks. oh man, I have never had SUCH delicious majestic dutch cocoa powder. We have used this in cakes, brownies, cookies, cupcakes, and no matter the delicacy, this can't be beat.